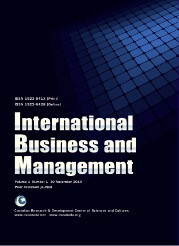 International Business and Management is a new academic journal of the Canadian Research & Development Center of Sciences and Cultures. It is published on a Quarterly basis. IBM aims to stimulate in-depth and rigorous empirical and theoretical research in the field of international business, trade and management. It also intends to encourage research on exploring the changing pattern in international business and management and how it is related to the economic growth of the current world. International Business and Management is indexed by DOAJ of Sweden, CNKI of China, Journal TOCs of England, Open J-gate of India；filed by Library and Archives Canada, Gale, EBSCO Publishing, Ulrich's of America; and collected by the database AMICUS of Canada, indexed by ProQuest LIC.  Coverage: The purpose of the Journal is to provide a forum to share knowledge related to broad range of topics including commercial science; Business management and operation management; Accounting; Management services; Business Communication; Business/Managerial Economics; Business Operations; Financial Management and financial administration; Tourism and Travel Services Management; Human Resource Management; International Business; Management Information Systems and Services; Management Science and Quantitative Methods; Marketing; Real Estate; Taxation; Market operators; Special market operation; Insurance; Capital Construction Management and other.  Language: IBM collects articles written in English only. Format:The only format we accept is APA Style. 1. The manuscripts are required to be written in English, and they should be submitted to ibm@cscanada.net or caooc@hotmail.com. The preferred format is MSWord. 5. The copyright of the articles goes to the authors, while IBM owns the first publishing right. 6. As for the publication fees, 40% of the articles are free, on the basis of assessment results given by our editorial team. Excellent articles will be published with no charge, but others will not.